Gibson's character is called Mayhem, "embodiment of raw justice and vengeance"
LOS ANGELES, California (CNN) -- Tyrese Gibson is far from the first singer to make the transition from music to movies. However, the "Transformers" star is blazing a whole new trail with his latest crossover venture. 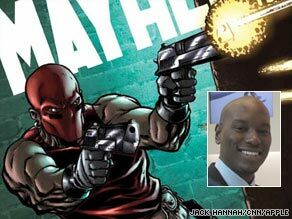 Tyrese Gibson voices "Mayhem," a hero described as the "embodiment of raw justice and vengeance." The actor/singer/model has partnered with Apple to develop his own comic book series called "Mayhem," and he's doing it in a very nontraditional way -- digitally. "There was an experience that I felt was pretty limiting as far as the comic book experience itself on paper," says Gibson, who stresses that he did not grow up reading comic books and is not a comic book veteran. "[So] I set up this technology with my team and this is the first-ever digital comic book [on iTunes] in the history of comic books." The third issue of "Mayhem," which is downloadable from iTunes, is the first to go digital. It features an interactive version of a comic book with sound effects, page turns and even voiceover. Gibson himself voices the title character, a masked, dagger-hurling hero described as the "embodiment of raw justice and vengeance." Gibson's new hobby is another example of Hollywood's love affair with comic books. Just last month, Walt Disney Studios acquired Marvel Entertainment -- and all 5,000 of the comic book company's characters -- for $4 billion in cash and stock. With the success of action films based on comic book notables, including "Batman," "Iron Man" and "Wolverine," it's not a stretch to think that Gibson might be strapping on the "Mayhem" costume for a summer blockbuster in the future. But for now, Gibson is focused on the early stages of his new venture. Although he would not provide details on sales figures, he did say that worldwide sales of "Mayhem" would "knock your socks off." The following is an edited version of the interview. CNN: What turned you on to comic books? That really did something for me, because I'm motivated by passion. I thought ... I want to figure a way to be a part of this world, and that's when "Mayhem" was born." CNN: Where did the story of "Mayhem" come from? Gibson: Me and my partner Mike Lee and Will Wilson all got together, we started brainstorming about different concepts and different directions we could send this character in and we came up with something pretty unique. It's an ongoing series and so as soon as you think you've got it figured out, there's a cliffhanger that makes you want to read the second issue and the third issue. CNN: You're a newcomer to this genre. What's been the feedback from the comic book community? Gibson: In everything you do, there's gonna be cynics and those folks questioning what your motivation is behind getting into anything. I dealt with it when I went from one career move to the next: "Man, stick to singing; stick to acting." I dealt with a lot of that from certain folks in the comic book world. ... They wrote these long e-mails and [started] on a smear campaign. I came into this whole thing very innocent. I discovered my love for comic books and I want as many people as possible to experience my comic book. There's this digital revolution that's out there but the comic book world has not embraced this digital revolution on a level that it should be embraced on. And so I reached out to my contacts and I set up a meeting ... and this is my baby. CNN: Artist Jim Lee is very big in the comic book world. How did he get involved in this project? Gibson: I found Jim Lee on Twitter ... and we just kind of took it from there. CNN: What did you learn from him? Gibson: So much, so much. He basically made me aware of all of the big players in the comic world like Alan Moore and Grant Morrison. He just painted this picture about who's who in the comic book world and he schooled me on that level. CNN: A lot of comic book characters become heroes on the big screen. Does "Mayhem" have a future in film? Gibson: Right now, there is no conversation on any level about "Mayhem" becoming a film. We've been approached a few times but my mind state is this: You can't expect to sell out the Staples Center until you sell a bunch of records. So we're really trying to establish the fan base for "Mayhem" before we try to turn it into film. There's still plenty of time for that.